Engaged in "historical research", the Enterprise time travels to 1968 Earth where they encounter an interstellar agent planning to intervene in 20th Century events with motives uncertain to Kirk and Spock. "Assignment: Earth" is the last episode of the second season and was first broadcast on March 29, 1968, and repeated on August 9 of the same year. It is episode No. 55, production No. 55; it was written by Art Wallace, based on a story by Wallace and Gene Roddenberry, and directed by Marc Daniels. This episode served as a backdoor pilot for a proposed spin-off television series, produced by Roddenberry, also to be called Assignment: Earth. Guest performers Robert Lansing, as Gary Seven, and Teri Garr, as Roberta Lincoln, would have continued in the new series had it been commissioned. That Assignment: Earth obsession site was a great find, Benway! Thanks for the research. 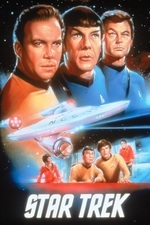 This one is pretty much a bust as Star Trek, and as a season finale. (They didn't really do 'season finales' all that much in the 1960s anyway. And as production wrapped for the summer, they weren't all that sure that there would be more Trek.) And being that it was a 'backdoor pilot' -- as all the cool kids call it now -- and one that takes place on 20th century Earth, there's not much Star Trek in it. "Assignment: Colon" has some of my least favourite science fiction elements: alien abduction, time travel, shape-shifting, and cats. There's also not-one-but-two time-is-running-out plot points: sabotaging the missile before it launches and blowing it up at just the right altitude. I'd like to remind the writers that it's the Enterprise crew that's visiting from the future, not Seven or his alien employers. How could they be so sure that this particular scare tactic would bring about diplomacy and anti-missile treaties rather than, say, a 'frank exchange of views' via said missles? On the other hand: Terri Garr! What's not to like about Terri Garr? Hmm, well . . .
“I have nothing to say about it. I did that years ago and I mostly denied I ever did it. Thank God [the pilot didn't sell]. Otherwise, all I would get would be Star Trek questions for the rest of my natural life – and probably my unnatural life. You ever see those people who are Star Trek fans? The same people who go to swap meets.
. . . I liked Gene Roddenberry, but I don’t remember those people. I really don’t want to talk about Star Trek. That’s what I told them about this interview. . . .
Well, we love you anyway, Terri. The full interview is buried in this text file. Lansing is good as Seven, in the cool block of stone late 1960s hero mode. But it's not clear that there's any chemistry between Lansing and Garr, and love triangles are boring, especially when one vertex is a cat. I'd be willing to bet that if Assignment: Colon had been picked up as a series, it'd last about six or seven episodes. All these years, I never picked up that that was Victoria Vetri who played Isis in human form.Victoria When Dinosaurs Ruled the Earth Vetri; Victoria Invasion of the Bee Girls Vetri; Victoria nine years for attempted murder Vetri; Victoria You look just like Victoria Vetri! Huh? Vetri. Hoo-boy! 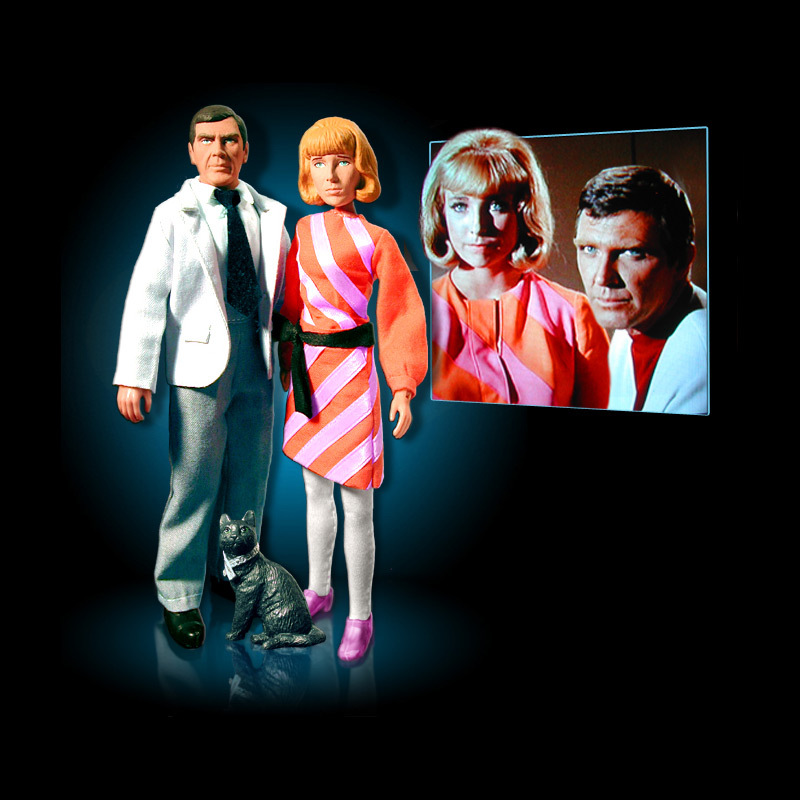 Gary Seven and Roberta Lincoln action figures. Not contemporaneous, I assure you. 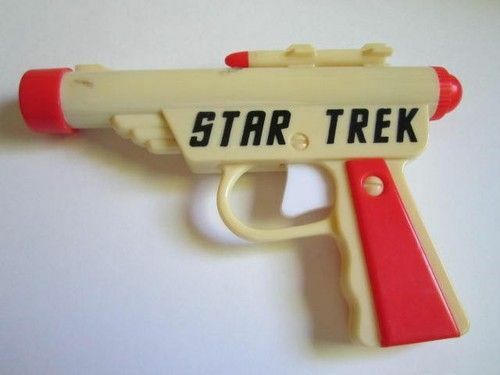 In the 1960s, whoever makes these decisions couldn't even get their act together to produce toys that looked remotely like Star Trek props or vessels*. Usually they'd just slapped the words "Star Trek" on the side of some generic space looking piece of plastic and add in some "army men" molded in the Star Trek uniform colors instead of olive drab. * With the obvious exception of the AMT model kits. I always thought of it as Gene Roddenberry's Plan B for when (not if) Star Trek was cancelled; it had the virtue of being much less special effect, prop, makeup, and set-heavy than Trek, which required new examples of each with almost every episode. Throughout the 70s Roddenberry spit out pilots like Old Faithful. They used to air them as TV movies from time to time. I don't think any of them went anywhere until well after his death, when cable bandwidth increased the demand for product and TNG succeeded. Then Majel Barrett Roddenberry dusted them off and got a handful of them launched in syndication. I also seem to recall there being a surprising number of cats that turn out to be shape shifted people. It's one of his things. Like John Woo's slow motion doves and churches. While this episode isn't so hot as Star Trek, I think it could have been a really fun series and it's kind of surprising more hasn't been done with the premise. I'd love to see a 1999 UPN reboot, for instance. Everything in Trek gets mined for novels and toys and stuff eventually... so where's all the Gary Seven stuff? Trek . . . toys . . . so where's all the Gary Seven stuff? You could follow one of the links in my comment above, where I call the thread's attention to the existence of Gary Seven action figures. (Apparently the "http://" got truncated off the "Action" link, so it doesn't work). You could follow the link in the FPP, which is how I got there. Scroll down to the heading "Media". You could follow this link. Day of the busted link! None of that site's internal links / bookmarks actually work. Also it's got a (brief) autoplay audio clip. Badly designed, but it's quite the valentine to this single ep. I have such love for this episode. I know it's a back-door pilot, I know it doesn't make much sense, but, for some reason it was one of my favorites when I first watched the series, and on this re-watch I still completely enjoyed it. Herodios, why are you assuming Ursula didn't see the links? Because I read all three sentences. Quote: "Everything in Trek gets mined for novels and toys and stuff eventually... so where's all the Gary Seven stuff?" This seems like it's getting needlessly scrappy. That's a fun-looking website. Looking at it, I see that Gary Seven has appeared in some Trek novels, although from a quick glance I don't get the impression he's been the lead in anything but fan stuff. The action figures were also fan-made. Realistically I didn't expect action figures, although Playmates made a gazillion Trek figures and I wouldn't be stunned if they had made some. Perhaps it would have been more accurate to observe that the character hasn't been used nearly as much as I would expect given that he was the star of a backdoor pilot on the original Star Trek. The action figures were also fan-made. Realistically I didn't expect action figures, although Playmates made a gazillion Trek figures and I wouldn't be stunned if they had made some. They all appear to have been made in imitation of / tribute to well-known toy lines. I'd never heard of "Playmates" toys , but it's clearly a thing. Surprised there's no fan-made Lego version. I'm from the Meccano / Tinker Toy / Lincoln Log era, myself. Backdoor Pilot sounds like the name of a terrible college band. Makes as much sense as a Stone Temple Pilot or a Palm Pilot. My girlfriend used to collect the Playmates figures, and while I'm not a collector type myself they were pretty neat. The likenesses were quite good, and they had figures for the most obscure stuff. Like, Doctor McCoy as a 100-plus year-old-man from Encounter at Farpoint. They made a figure of him! So it wasn't impossible they made a Gary Seven, but that seemed like a deep cut even for the Playmates toys. I wasn't that into it when she was buying them, but a few years ago my girlfriend got disgusted with collecting and purged everything, and now I find that I really miss that shelf of tiny Star Trek people. It was cool to see almost everybody from Star Trek from 1966 to 1996 or so, all together on a shelf like that. One of these days I may have to go on an Ebay jag myself and buy 'em all back! Ugh. Don't even remind me about all the Playmates figures I abandoned, along with all the rest of my Star Trek stuff. I used to be a keen model kit builder. I built tons of hot rods, military aircraft, Universal movie monsters . . . . I had a Route 66 Corvette, A Drag-u-la, a Munster-mobile. Never a Batmobile. We did a 'scene' where we torched the Dracula (Lugosi) model, 'cuz it was daylight. That plastic stuff really goes up with satisfying and probably quite toxic stench / smoke. I built two USS Enterprise kits: one a US Navy aircraft carrier and the other a starship. Sometime before 1968 I built the Star Trek USS Enterprise and Klingon Battle Cruiser kits. As I understand it, there were two versions, one with lights and one without. My Enterprise had illuminated power nacelles, bridge domes, and running lights. I don't recall my Klingon ship having lights. The Enterprise plastic was white, I think, and the klingon ship was sort of greenish. I did an okay job, I think. No painting required. Lights worked and everything. Some of my military planes were tougher: more detail. I had 'em all suspended on fishing lines at dramatic angles. I wonder what the Trek models would be worth now, assembled. I only see unassembled in-the-box examples for sale on Ebay. Prices vary a lot. But I didn't have 'em 'cuz I was a collector. I had 'em 'cuz I was a kid and they were fun. Where are they now? Probably with my Pete Rose and Johnny Bench rookie year baseball cards. Remember kids, 'use only Testors™ brand glue and paint'. Looking at it, I see that Gary Seven has appeared in some Trek novels, although from a quick glance I don't get the impression he's been the lead in anything but fan stuff. Khan might be on the covers of the Eugenics Wars books, but trust me, they're Gary Seven and Roberta Lincoln novels more than anything. They're riotous fun, especially if you enjoy playing "Spot the Reference." I had always been a little lukewarm on this episode, but Greg Cox made me a Gary Seven fan. A lot of Gary Seven seems to be a ripoff of Doctor Who: mysterious man interfering with Earth's past, female companion(s), fantastic technology, he even uses a tool identical to a sonic screwdriver to escape the Enterprise's brig.